I just love these "back in the day stories" like this and about old restored 911's. Probably the main reason I read the BB. Dave . . . your stories are the best. I never had the chance to experience Mulholland in those days, so it's great to hear them now. Encore Please . . . I have a copy I bought off Ebay...cost $30 you want it? Sure!! Paypal ok for you?? Yup. I'm loving these stories too. Keep 'em comin'! Nope- dark faded blue. You may have been thinking of Rex' white swing axle bug on 13" spoked steel rims with radial t/a's (hottest tire of the period) . The itnerior was totally stripped except for 2 light baja bug fiberglass seats and some carpet.With Rex' magic engine building , a 2180 steel cranked , twin weber motor put out some serious power. Close ratio gear box , no camber compensator (where's your sense of adventure? ), and doubled up stock front sway bars made the basic package. Add in a cracked windshield : On the passenger side of course- you had to push on it everytime he went passed 80 mph (which was often) . One could say that the ride was exhilarating - that in itself is an understatement. He didn't hang around so much up there as he would run back and forth on occasion. Again something to do with lack of license from time to time. The current fast flavor of the summer was a J. Hall with a built up camaro and lots of cojones. Hall was doing "laps" back and forth in front of Grandstands when Rex came up behind him, passed him thru the sweeper on the downhill and just disappeared . Hall, needless to say , was flumoxed at his being dissed so publicly by this "humble " bug. Dave, you're a good story teller. Has anyone ever told you that? You put me right there in the action. Where the heck is "Grandstands"? Grandstands is on the Valley side of the subtle S section as you go east on Mulholland from Coldwater. There's a lot of shrubs and such there now, and a little parking area for an overlook. That used to be all flat and empty, where everyone stood to watch the racing. It would be interesting if that old 911 were back out. Of course, where would it be run today? Most of the wild looking 911 based cars are, frankly, a lot more show than go. GREAT looking but if you look hard enough a well developed edgy car will smoke them. Not intended as a put-down on them as they are great and wild looking but my experience is that almost always there are a LOT of relatively low key looking Porsches that are a lot faster/better. Just like the old hot rodding days where the owners get more opportunity to USE them without attracting all the attention. Example: Your black 914-6. Yea, think about it if it is REALLY used. I too am enjoying all this. Being NCal and in my wildest day, in the Monterey Peninsula, most of our driving were without witnesses. I can vouch that the Big Sur cliffs owned a great many fast sports cars and drivers in the period. I got offered more than one newish built Porsche... thoroughly trashed, after it was winched up off those cliffs. I didn't have much money either but it killed me to pass of a thoroughly bent but still driveable 6 month old 911 for $1500! Please, more stories and history. Is that book actually good??? My best stories from Big Sur [that, and Jack's Peak- which used to be dangerous, challenging, and pure fun before it got all de-lovely paved with huge houses everywhere] have mostly been told elsewhere. For here tho.. a great hard run with a well known Cobra driver [me in my tweaked Stingray] and finally having to abort due to heavy fog rolling in but a nice brief chat and back to our sane lives... and then teaching my brother that my puny old Speedster could dust his modded FI Vette on that same road. 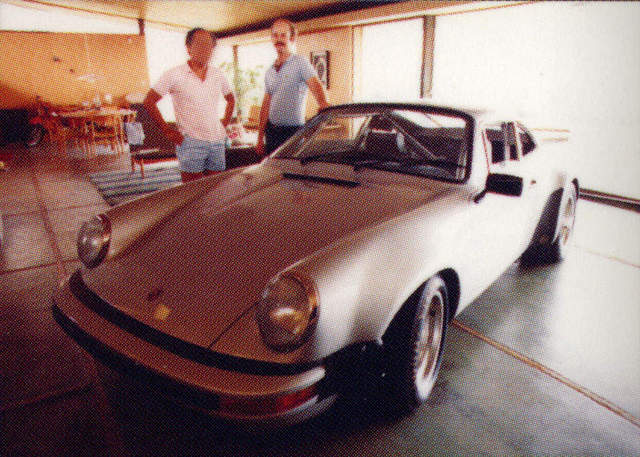 [He bought his 911 a month later.] Most of the guys that ran hard were solo so there was no one to call for help if you went over. A lot of bodies were found a month or so later by hikers. Beautiful place and still neat but better paving, guard rails, and modern tires and cars have dilluted what used to be a shattering experience if you pushed it to the limit. Re: What happened to the Mulholland "King of the Hill" RSR? What you guys don't know is that the blurred out face on the left is in fact Dave Bouzaglou. He still owns those shorts and every once in a while when it's warm out he puts them on, leaves the beater at home and brings his 914-6 down to TRE wearing a nostalgic pair of gold-framed Porsche Design aviators and a pinky ring. True story. Ok, so when is one of the gazillion writers on here going to do the interview and then photograph this car for EXCELLENCE? Last edited by rdane; 01-09-2007 at 12:06 PM..
JR- you obviously have not been behind me on a fun run or the Iron Bottom Rally. The 6 has been, and will continue to be, REALLY used on the track and the street. For the most part, the Hill lurkers that were really into competition , are in some form of motorsports or other to this day. From the Mulholland Racing Association (late 60's) I know of several of the guys that were quite competitive in SCCA, IMSA, etc. Some of them are in the auto related biz. The same applied to the CRE days and to some lesser extent the ACR and other following groups. Obviously the majority of this stuff was illegal with all the speeding, crossing over the line, breaking into Willow in the middle of night (yeah- we got away with it- Sure is DARK with no moon and no lines to guage the track by. Though when we went back en masse for a clandestine race day when the track was closed on X mas day- we did get busted by the sheriffs. But I digress..
We had a LOT of fun over the years up there with no drugs, little alcohol (those that drank were shunned because of the danger they were posing- save Charlie; he could do whatever he wanted) Traffic was fairly light and mid summer nights were sublime with 70 degree weather, full moons, and an empty "track". Keeping your car prepped safely and properly was a big plus with the groups. I do like the idea of an Excellence piece on the car. See some pics of it now. Some sort of restoration project maybe. The way I see it, the Mulholland racing scene is quickly being forgotten about. One book (honestly, not well written), and one ****e movie from the 80's does not really do its history justice. It would be nice to see its history remembered like any grand ol' race track of yesterday. The more ways to remember, the better. Is is imopssible to sanction an event on a road like this? They do it for all those events like the Silver State Classic. In our late teens up there we would fantasize on how we could "organize" a race that encompassed all the cool roads , starting with Mulholland, so we could complete laps thru the hills. We even piled 8 of us into my dad's Fleetwood Brougham one nite to try an discover the secret passages. Fantastic stories. Cup, have you ever thought about writing a collection of stories? He really should. We could hold interview sessions at 4 n 20 Pies (favorite pre-race hangout)!